At Ken Shaw Toyota, we maintain one of the largest inventories of original Toyota parts and accessories in Toronto and the GTA. High-quality genuine Toyota components and products are essential to ensure your vehicle stays in optimal condition and retains its resale value down the road. At Ken Shaw Toyota, our parts experts can advise you and help you choose the right parts or accessories for your Toyota or off-make car, SUV or small truck. For your convenience, you can use our handy online form to order your needed parts and ensure quick delivery. We also want to make sure you benefit from great savings, so we feature regularly updated promotions on parts and accessories in our Toyota parts and accessories department in Toronto. Clearly better. Engineered to match the size and shape of your Toyota's windshield. All-Season Wiper Blades feature an aerodynamic steel frame and twin-rail refills for better performance. They offer exceptional strength and durability for the spring, summer and fall seasons. They are engineered for a better fit on curved windshields. A precision cut rubber edge provides superior wiping action. If the wipers are chattering, streaking or otherwise failing to wipe cleanly and consistently, you need new blades. Cracked, ripped or frayed wipers need to be replaced. A premium -40°C all-season windshield washer fluid and antifreeze. To purchase, please visit our Parts Department. 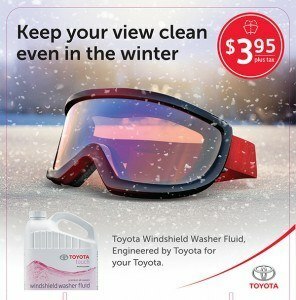 Why Toyota All-Season Wiper Blades? Designed using tensile strength steel and all natural rubber. The twin squeegee distributes wiper arm pressure evenly across the blade. Easy to install with pre-assembled universal mount. Aerodynamic design contributes to a quiet, noise-free ride. Toyota Genuine Air Filters are triple-layered for maximum efficiency and a longer life. Air filters prevent harmful particles from entering your engine and causing damage. Cleans up to 24,000 litres of air per hour when driving at 60 km/h. Air filters eventually become clogged with trapped particles and as a result this will reduce engine performance. 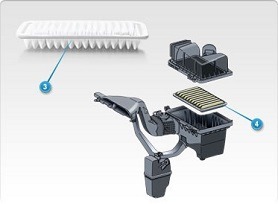 A clogged filter starves your engine for air, reducing fuel economy and increasing emissions. Remove and inspect every 6 months or 8,000 kilometres and replace as needed. Keeps the air in your Toyota fresh and clean. Replace every 12 months or 16,000 km, or more often if you or your passengers suffer from allergies. Cabin Air Filters capture unwanted particles such as pollen, dust and other pollutants before they enter your vehicle's compartment. The benefit is cleaner, fresher air. A vehicle's cabin can contain high concentrations of dust, pollen and other unwelcome air particles which can potentially affect the comfort and health of vehicle occupants and aggravate allergies. Driving in heavy traffic, urban or dusty environments or on dirt roads may shorten the filter's life. 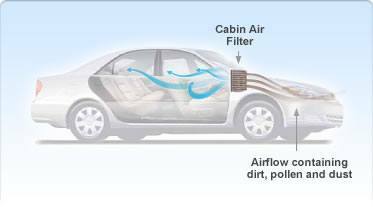 * Cabin Air Filters are installed on all current Toyota models (2006 model year and newer). 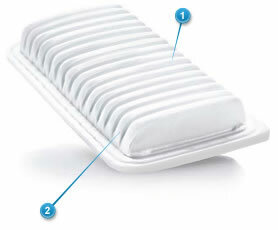 Standard filter designed to capture particles including pollen, dust and other allergens. Functioning much like a Pollen Filter. It also holds a static charge that captures smaller particles like brake and tire dust. Made from the same high quality filter material as the Toyota Genuine Cabin Air Filter, the charcoal filter adds a layer of activated charcoal to absorb and remove odours. Results are cleaner, fresher air for your cabin. Offers the same benefits as the standard cabin air filter with an additional layer of protection that absorbs unpleasant odours.